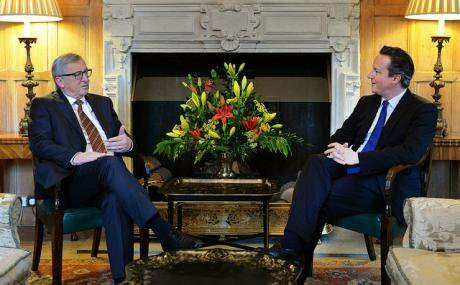 David Cameron with president of the European Commission, Jean-Claude Juncker. Flickr/Number 10. Some rights reserved. The outcome of the British government’s attempt to renegotiate the UK’s terms of membership of the European Union and the referendum that will follow is highly uncertain but the renegotiation reveals quite a lot about David Cameron. For a start, the decision to renegotiate relates much less to the UK’s interests than it does to Cameron’s inability to modernise his own party and face down its increasingly vocal right wing. He now spends most of his time talking about and dealing with the last issue he said he wanted his party to talk about when he became leader of the Conservative Party more than a decade ago. More importantly, the way in which he is going about a crucial part of this renegotiation reveals that – far from what one would expect from a self-proclaimed moderniser – key policy decisions pay little heed to evidence. Of all the EU-related issues that Mr Cameron raised in his letter to the President of the European Council Donald Tusk, the treatment of EU citizens in the context of the UK’s welfare benefit system (i.e. monies that UK-based workers receive if they meet certain income-related criteria) is, by far, the thorniest and the one that has attracted the largest amount of media attention both in the UK and beyond. Fanning the flames of populism in relation to what he calls “welfare tourism”, Mr Cameron has repeatedly stressed that he wants to stop these benefits “acting like a magnet”, creating incentives for other EU nationals to settle in the UK under the EU’s fundamental principle of free movement across the borders of its member states which ensures that moving from, say, Warsaw to London for work is no different to doing so from Montgomery, AL to San Francisco, CA. As a public policy issue, EU nationals’ access to the UK benefit system has at least four partially overlapping facets. One is fairness (equality before the law irrespective of nationality or, as Jeremy Corbyn rightly put it, “if somebody is working, paying taxes, doing a job just like anybody else, then surely they deserve access to exactly the same benefits as anybody else”), the second is public finance (since it relates to expenditure or, in the case of tax credits, the non-collection of potential revenue), the third is the labour market (the availability and cost of labour) and another one is migration (the relationship between benefits and a migrant’s decision to come to the UK). Fearful of UKIP’s emotive, divisive and populist rhetoric and recent electoral results, Mr Cameron has explicitly focused only on the latter aspect of the aforementioned issue, partly as a result of the high salience of immigration in the UK (which, as Simon Tilford rightly points out, reflects the failure of successive governments to take appropriate action). Mr Cameron’s decision has two implications. ‘the vast majority […] were attracted to the UK […] by the chance to build a “normal life” for themselves and their families’, and not the opportunity just to claim benefits. In the words of one leading expert ‘EU migrants come here overwhelmingly to work - in fact their employment rates are considerably higher than for either natives or non-EU migrants’. Even more embarrassingly, when the European Commission queried the British government on accusations made in relation to “benefit tourism”, the response was: “We consider that these questions place too much emphasis on quantitative evidence”, perhaps because they know that the British public’s perceptions are wrong in relation to a whole array of quantifiable issues including the scale of immigration, crime, welfare fraud etc. When (in November 2015) Mr Cameron did use figures to justify his party’s stance, the UK’s Statistics Authority accused the government of trying to avoid scrutiny by not disclosing important sources and calculations that could have helped independent analysts assess the figures and when (two months later) a government minister was asked to produce figures showing that “benefit tourism” encourages EU migrants to come to the UK, he reportedly did not produce any. In addition, given the Guardian’s revelation that HM Revenue and Customs, the UK’s tax collection authority, ‘defines “non-UK families” as those where at least one adult in the claimant family is a migrant, meaning that mixed families where one partner is a British national are classed as immigrants’, it became clear that the number of in-work benefit claimants would be artificially inflated precisely because of the definition used. When the HMRC was asked (on the basis of the UK’s Freedom of Information legislation) to reveal ‘how many British nationals claiming tax credits are being counted as migrants’ because of that definition, it failed to provide an answer. This is not the first time Mr Cameron has made key decisions without a sound basis on evidence. The Conservative-Liberal Democrat coalition government that he led for five years conducted a very wide-ranging review of the balance of competences between the EU and the UK. That review ended by concluding that – by and large – the balance is right. No wonder the British public has not heard him say much about it since then, as the House of Lords pointed out. This might be linked to the fact that at least some of its content was not to his ministers’ liking. Furthermore, prior to the onset of the financial crisis he had promised to match the Labour government’s spending plans. Yet shortly after the onset of the crisis he accused the Labour government of not ‘fixing the roof when the sun was shining’ although there is no evidence that UK governments had been profligate until then. There is a second, much more disturbing potential consequence of his stance on the issue of migration from EU countries. Even if Mr Cameron manages to convince the UK’s EU partners, he will ultimately fail to achieve his declared policy objective which is to reduce the attractiveness of the UK for other EU nationals, especially those from central and eastern European countries, after he has – of course – declared ‘victory’. This would not be the first time a British Prime Minister declares victory of this kind. Both Harold Wilson and Margaret Thatcher made exactly the same exaggerated declaration in the mid-1970s and mid-1980s concealing from the British public the fact that on both occasions the final result (of the renegotiation of the UK’s terms of membership in the first case and the UK’s contribution to the EU’s budget in the second) was closer to what the UK’s European partners had wanted. Nevertheless, this time has the potential to be far more dangerous for the UK. The way Mr Cameron has been dealing with this important issue is bound to further erode public trust in politicians and fan the flames of populism (of which there is no shortage in the UK), because as long as the British economy keeps generating jobs – irrespective of how safe or well-paid they are – it will keep attracting the young and often well-educated central and east Europeans that it has been attracting since the mid-2000s. Politicians who – unlike Mr Cameron - care about the Old Continent’s long-term prospects ought to engage in an EU-wide debate on the redistribution of resources that needs to take place so as to enable local communities where these people settle to cope with increasing demands placed on schools, hospitals etc. But holding that debate requires - not playing to the gallery, which is in part what Mr Cameron has chosen to do – but having a different kind of leader, one who is prepared to fight against mistaken perceptions.